State policymakers play a significant role in ensuring their residents have access to affordable, high-quality health care. This is particularly true for people covered through Medicaid, the federal-state health insurance program that covers more than 74 million Americans. Author Abrams, Melinda K.Adams, KarenAdland, SaraAlteras, TanyaAlvarez, BeatriceAnthony, StephanieArio, JoelAtkinson, GrahamAudet, M.D., Anne-Marie J.Bachrach, DeborahBailit, Michael H.Bainbridge, EmmaBangit, ElizaBarbarotta, LindaBarth, Michael C.Bates, M.D., DavidBeckerman, J. ZoëBelloff, DinaBerenson, JuliaBergman, DavidBernstein, WilliamBethell, ChristinaBeutel, SophieBihrle Johnson, MarianBishop, ShawnBlendon, Robert J.Blumberg, Linda J.Blumenthal, M.D., DavidBodenheimer, ThomasBoozang, Patricia M.Brantley, ErinBraslow, LauraBricklin-Small, DavidBrowning, LindseyBryant, NatashaBuettgens, MatthewBurton, AliceButtorff, ChristineBuxbaum, JasonCaballero, AndréaCantor, Joel C.Carlson, Matthew J.Chakraborty, OugniChen, Lanhee J.Chernew, MichaelChin, MatthewChollet, DeborahColeman, AkeiisaCollins, Sara R.Corlette, SabrinaCox, MarisaCrowley, Jeffrey S.Crystal, StephenCurran, EmilyDalton, JenniferDash, Sarah J.Davis, Hailey E.Davis, KarenDermody, CaraDesRoches, Catherine M.Detty, AndrewDorley, MarkDoty, Michelle M.Dougherty, Richard H.Edlund, TinaEdwards, ElizabethEdwards, Jennifer N.Eibner, ChristineEpstein, Arnold M.Fairbrother, GerryFaux, MelissaFeder, JudithFelland, Laurie E. Fish-Parcham, CherylFisher, Elliott S.Fox, KimberleyFrank, Richard G.Friedenzohn, IsabelFry, CarrieFryer, Ashley-KayGabel, Jon R.Gabow, PatriciaGarber, TracyGauthier, AnneGerovich, SuleGibbs, Brian K.Gifford, KathleenGilstrap, Lauren G.Giovannelli, JustinGlied, Sherry A.Goe, ChristinaGold, MarshaGoldberg, LeeGoldmann, Donald A.Gordon, PamelaGould, AlixandraGourevitch, RebeccaGrady, AprilGreer, Ann LennarsonGrumbach, KevinGunja, Munira Z.Gunsalus, RachelGustafsson, LovisaGuterman, StuartGuyer, JocelynHaase, Leif WellingtonHale, StephaineHalfon, NealHall, Jean P.Hall, Mark A.Hamblin, AllisonHartman, ThomasHasnain-Wynia, RomanaHatfield, Laura A.Hayes, Susan L.Hess, CatherineHester, JimHighsmith, NikkiHoadley, JackHolahan, JohnHomer, Charles J.Hostetter, MarthaHouston, RobHow, Sabrina K. H.Hurt, Carla Ireys, Henry T.Jackson, AdlanJohnson, KayJoines, WesleyJones, ShyloeJost, Timothy S.Kane, Nancy M.Karl, AnneKaushal, RainuKaye, NevaKeith, KatieKiszla, JordanKlein, SarahKolber, MichaelKoller, Christopher Komisar, HarrietKona, MaanasaKramer, SandyKrissik, TaraKronebusch, KarlKu, LeightonKuhmerker, KathrynKutyla, ToddLambrew, Jeanne M.Lamphere, JoAnnLeCouteur, EugeneLeavitt, MichaelLechner, Amanda E.Lewis, JulieLim Warner, MichelleLippa, JacobLipson, Debra J.Liu, JodiLong, Sharon K.Lopez, NancyLucia, KevinMa, StephanieMacTaggart, PatriciaMachledt, DavidMann, CindyMarkus, Anne RossierMartinez-Vidal, EnriqueMaylone, BethanyMcCarthy, DouglasMcCue, Michael J.McDonough, John E.McGinnis, TriciaMcKethan, AaronMcWilliams, J. MichaelMead, HollyMehrotra, AteevMehta, DeviMeyer, JackMika, StephanieMinnes, KatherineMinyard, Karen J.Miskell, SeanMonahan, ChristineMoody, GregMoulds, DonaldMueller, KimberlyNavarro, Amanda M.Nobari, Tabashir Z. Nowak, SarahNuzum, RachelOrav, E. JohnOrris, AllisonPagel, ChristinaPalanker, DaniaPanares, ReaPelletier, HelenPeng, CarolPerlman, Sylvia B.Pernice, CynthiaPerry, MichaelPhillips, Jr., Robert L.Pollitz, KarenPourat, NaderehPurington, KittyQuincy, LynnRadley, David C.Rasmussen, Petra W. Reagan, EstherRegenstein, MarshaReuland, Colleen PeckRiley, M.D., PamelaRizzo, JasmineRoberts, DennisRoberts, Eric T.Robertson, RuthRodin, DianaRosenbaum, SaraRosenthal, JillRothenberg, SaraRowland, DianeRusso, ThereseRyan, JamieSaltzman, EvanSavela, TerryScheppach, RaymondSchmucker, SaraSchoen, CathyScholl, BarrySchor, Edward L.Schwartz, SonyaScott-Harris, Janet L.Seervai, ShanoorSerafi, KindaShah, ArnavShah, TanyaSharac, JessicaShea, KatherineShearer, ChadShewry, SandraShih, AnthonyShin, PeterShort, Pamela FarleyShortell, Stephen M.Silow-Carroll, SharonSim, Shao-CheeSimpson, LisaSmedley, BrianSmith, JeaneneSmith, JennieSmith, VernonSnyder, AndrewSommers, AnnaSommers, Benjamin D.Spitzer, EliotSquires, DavidStewart, Alexandra M.Stone, RobynStremikis, KristofSummer, LauraSundwall, DavidSwartz, KatherineTakach, R.N., M.P.H., MaryTaylor, KimaTorres, Jacqueline M.Trail, ThomasVanLandeghem, KarenVelasquez, MariaVerdier, James M.Volk, JoAnnWakefield, MaryWaldman, Emily K.Wallace, Steven P.Weil, AlanWeinberg, MicahWeissman, Joel S.Whitmore, HeidiWilliams, AshleyWilliams, ClaudiaWillink, AmberWitgert, KatharineWrenn, JenniferWright, BillZezza, Mark A. 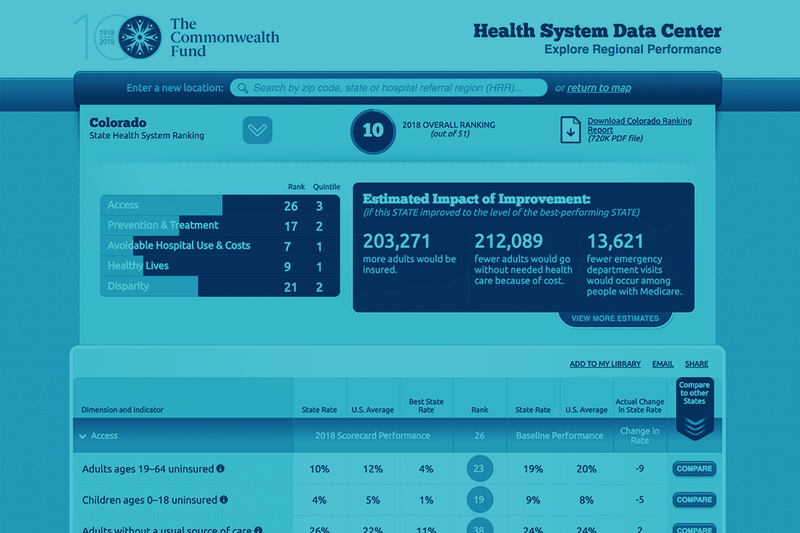 The latest scorecard measuring health system performance in all 50 states and the District of Columbia shows that the combined death rate from suicide, alcohol, opioids, and other drugs increased by 50 percent nationwide between 2005 and 2016.